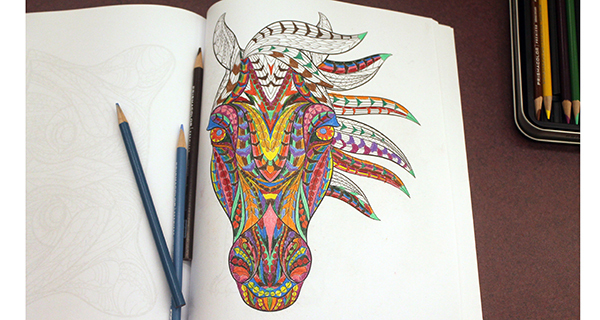 With libraries increasingly moving towards incorporating technology, the Dover Town Library boasts a decidedly old-school remedy to relieve visitors’ stress: adult coloring books. Yes, the long-preferred time killer of first grade teachers, overworked moms and sippy-cup-serving waitresses everywhere has made its way to adults, and the Dover Library wants to help residents get in on the action. While visitors cannot check out the coloring books for home usage, the library provides all the materials needed for the project. You’ll need to come at the right time, however, as the coloring books are only around on select days. But before you go, you should know that coloring books designed for adults are significantly different from those designed for children. Adult books are more like mosaics, with huge amounts of small surfaces that could be colored with different styles and hues. Coloring just one image is likely to take you multiple hours, and if you’re a perfectionist with a shaky hand, you could find yourself feeling more frustrated than relaxed. Still, if this sounds relaxing to you, check out the Dover Town Library. Just don’t be upset if a kid sits next to you and shows you how rusty you’ve become in your old (for coloring, at least) age.